No. This is NOT a hippy Monarch Butterfly. These are much smaller and fuzzier, as you will notice from the photos. In fact, the fuzz made it difficult for auto focus to focus on anything but the wings, due to their higher contrast. And these banshees zoom around much too fast to accommodate manual focus. The Monarchs we're all accustomed to are not due till later in the spring. 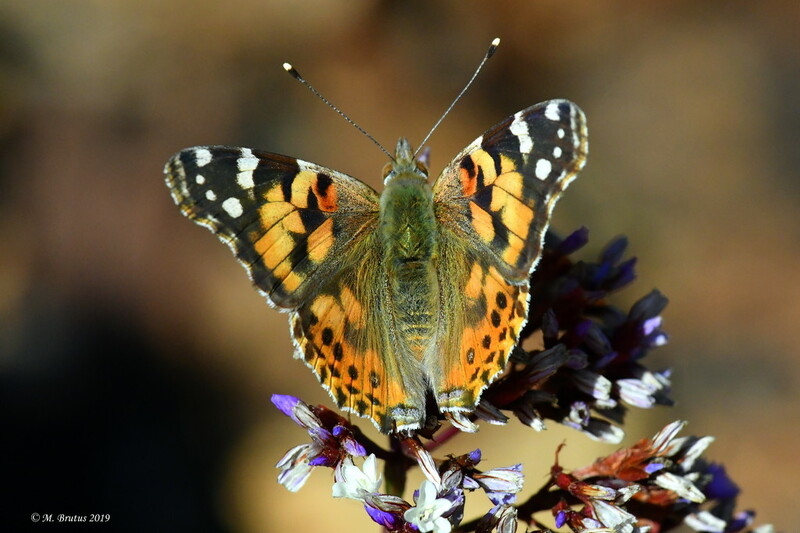 But residents in Southern California were alerted a week or two ago to a huge migration of these Painted Lady Butterflies, native to the Mexican Border area. Last year, researchers estimated as few as 25,000 butterflies made the annual migration up to Oregon. This year, due to abundant rain and flowers for food, they predict that number might reach over one billion! I must have seen at least half of them, myself. I first encountered them at the wildlife preserve where I shoot many of my bird pictures. They were zooming by so fast, I thought they might be hummingbirds in the distance. But they seemed too small. Finally, I determined they must be the butterflies. But apparently nothing n the menu at the wildlife reserve piqued their interest. They just kept zooming by in an unending stream, while I kept looking to find them slowed down and dining on a flower or bush. But I did not see so much as one thus inclined. I did not so much as bother to try to take a single photo. Imagine how fast they fly about. Just two inches big, they are believed to cover as much distance as one hundred miles a day. So they just swarmed by and I thought to myself, "Some natural phenomena just aren't meant to be photographed. But then, within a few days I saw them in my backyard. I grabbed my camera in the faint hope that I could catch one grazing. No luck in my back yard, where the floral pickings were still pretty slim this early in the springtime. So I moved my theater of operations to the front yard, where I have more flowers year round. As luck would have it, the Painted Ladies do have a sweet tooth for statice flowers, of which there are several. And for lantana, as well. But the truth is the Painted Ladies are as impatient as a classroom full of fourth grade boys with ADD when their Ritalin wears off. Typically, each butterfly would alight on a bush for a mere moment before flying off in a crazed dash. However, the Painted Ladies were so numerous, I was able just to point my camera at a particular flower with focus already set and just wait for the next Painted Lady to arrive. And never did those Ladies disappoint this gentleman. Now, it did take hundreds of attempts to get just few shots this clear of the entire butterfly. But the time and effort and the challenge were well worth it for the chance to study these unique and, oftentimes, rare natural wonders. What a nice shot of the Painted Lady - We see quite a few of those in the summer time - at least some years. Butterflies in general have been quite fickle the last few years. This is nice focusing with all the fuzzies. Your patience paid off - I can't imagine seeing that many fly by. A lovely capture, and narrative, Mr. B! They seem to have moth bodies, to me. These painted ladies inundated me also. They seemed smaller than Monarch but I'm no expert. The picture would easily appear on my calendar for 2019. You obviously overcame your auto focus issue and produced this gem.